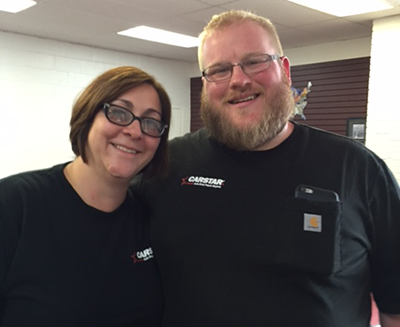 LEAWOOD, KS (October 26, 2015) – Jeremy and Theresa Orsky have quickly grown their collision repair business with CARSTAR Auto Body Repair Experts. They opened their first shop, CARSTAR Coach & Collision in Cleveland, OH, in 2012. Their second location, CARSTAR Tim’s Collision, in Twinsburg, OH, opened in late 2014. Now the Orskys have added a third shop, CARSTAR Brunswick, located at 1191 Pearl Road in Brunswick, OH. What makes this latest addition interesting is the uncommon way in which the Orskys found out about it. On occasion, Jeremy Orsky will shop ads on Craigslist for shop equipment or potential business opportunities. When an ad for a full body shop popped up, it caught his interest. CARSTAR Brunswick is an 11,000 square foot shop that sits on a two-acre fenced-in lot. It is a perfect complement to the Orsky’s other two locations. While all three shops are fully capable of performing high-quality collision repair work, the Orskys are now better equipped to load level their work depending on the type of repair. Their flagship location, CARSTAR Tim’s, is a 25,000 square foot I-CAR Gold certified shop which also carries all of the OEM certifications. That will be their central location where specialty work, like aluminum repair, will be sent. They are also set up to handle mechanical work at that shop. Orsky also said that his newest shop will soon join the other two with an I-CAR Gold certification. Not only does he employ I-CAR certified technicians, he is also an instructor.